The Nestle Benecalorie Unflavored Supplement 1.5oz Each, Model #28250000, is anchored in advanced science and research. Nestle Healthcare Nutrition offers nutritional solutions for people with specific dietary needs related to illness, disease states or the special challenges of different life stages. 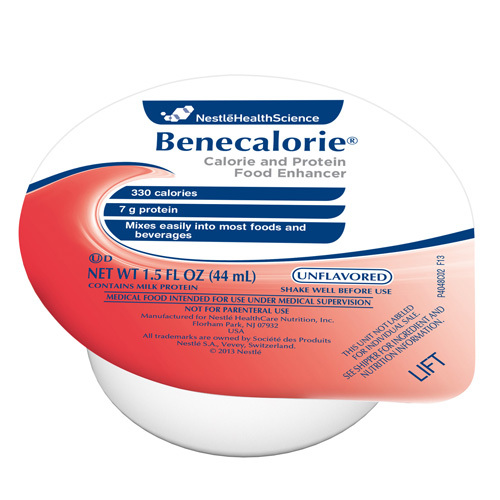 The Nestle Benecalorie Unflavored Supplement 1.5oz Each is a calorically-dense supplement that blends into most foods and beverages to increase protein and calorie content. One 1.5 oz serving provides 7 grams of protein and added vitamins C and E. Benecalorie is a great way to enhance foods with more calories and protein. For use under medical supervision. Highly concentrated source of calories and protein. 330 calories and 7 g of high-quality protein per 1.5 fl oz serving (44 mL). Mixes well into most foods and beverages. Allows for flexable serving options. This product is a medical food intended for use under medical supervision. This product is not intended as a sole source of nutrition. Ingredients: High Oleic Sunflower Oil, Calcium Caseinate (from Milk), Mono- and Diglycerides, Sodium Ascorbate (Vitamin C), Sorbic Acid and Benzoic Acid and Mixed Tocopherols (to maintain freshness), Alpha Tocopheryl Acetate (Vitamin E), Polysorbate 80, Zinc Sulfate, Sucralose.